Ria Loves Pawlish: OPI Deutsch You Want Me Baby? Mr. Pawlish and i headed to our favorite restaurant Sapporo tonight! we ended up getting a hibachi table and chef all to ourselves again... i feel so lucky :) and the food was absolutely amazing, the best i've ever had from there. OPI Deutsch You Want Me Baby? is today's 2012 Germany collection offering (and i'm LOVING the name!). the color switches from being more orange to more red in different lighting, and it tends to lean especially red on my skin tone. 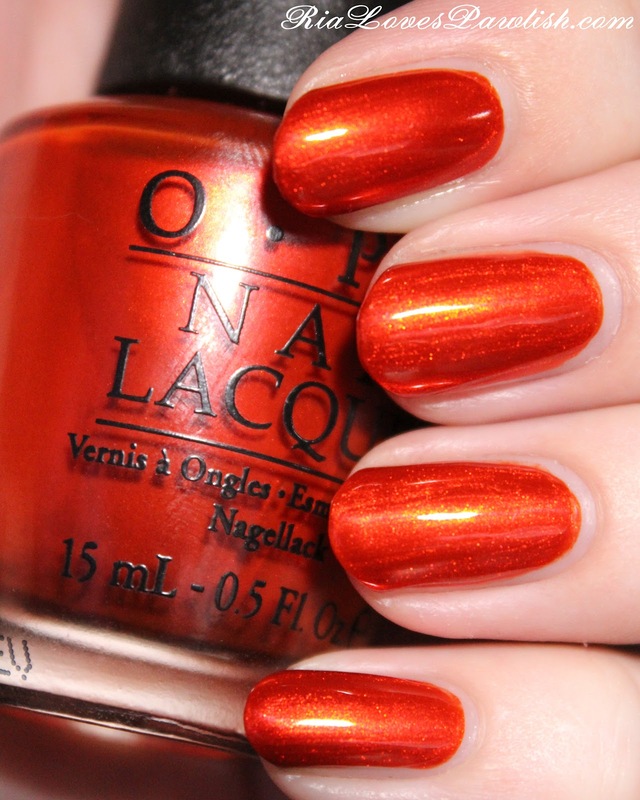 if you like to match your polish to the season, this one is perfect for Autumn! the finish is a shimmer that is a bit frosty owing to a little brushstrokeyness... since the color is so saturated, the brushstrokes really aren't noticeable. the formula is good, two coats for full opacity! two coats Deutsch, one coat Seche Vite. Just put this on and it is indeed beautiful!